The energy sector has largely been buffered from the worst effects of a partial government shutdown that's now entering a third week. Sources say that's largely due to the Trump White House prioritizing oil and gas — they also warn that could quickly change if closures continue. And so far, there's no end in sight to the spending impasse. "We have not seen any major effects of the shutdown," American Petroleum Institute CEO Mike Sommers said yesterday during a call with reporters, adding, "Obviously, it's not good for the shutdown to continue long term." While the Energy Department is open and buzzing along with appropriated funds, energy insiders are closely watching closures at EPA and the Interior Department for long-term policy delays. From critical regulatory policies to offshore drilling plans and legal hurdles, the energy sector is bracing for challenges tied to lengthy agency closures if President Trump and Democrats fail to forge an agreement on border security. One industry source said the rollout of Interior's interim offshore drilling plan was expected to be announced this month, and "clearly that's not happening and everyone has been sent home for the last three weeks." The final interim program is expected to lay out the location of lease sales for the next four to five years, and energy companies plan for months in advance for the leases that can amount to billions of dollars' worth of investment. The source said it's becoming increasingly likely that Interior won't unveil its interim plan this week or finalize the program in May or June as was originally expected. "When it comes to offshore, there are long planning periods, it takes many years," said the source. "Missing by a month will have an impact." But an Interior official stressed that the agency never said when the proposed program would be published and said the industry is merely speculating. No employees at the Bureau of Ocean Energy Management are currently working on the five-year program, the official said. According to BOEM's contingency plan, 84 out of 558 employees are currently working on emergency response and supporting their sister agency, the Bureau of Safety and Environmental Enforcement. Meanwhile, energy exploration off the Atlantic Ocean — the precursor to offshore drilling — appears to have stalled. Five companies are waiting on BOEM to issue final permits. In late November, they were granted authorization from NOAA Fisheries but still need the green light from Interior. "We have not heard anything," said International Association of Geophysical Contractors spokeswoman Gail Adams. "Before the shutdown we hadn't heard anything, and we haven't heard anything subsequent to the shutdown." Onshore oil and gas permitting, however, has stayed on track. The Bureau of Land Management is using funds from fees to continue to process permit applications to drill, an agency spokesperson said. It is unclear whether employees are preparing for the next round of oil lease sales, scheduled to occur in 11 Western states in March. Kathleen Sgamma, president of the Western Energy Alliance, is not worried yet. "Federal permit processing is anything but just in time. There can be many snags along the way, so operators normally request permits months before they plan to use them." In the short term, however, she said unexpected situations will inevitably occur in the field, and they require BLM staff support. "Hopefully the skeletal staff that BLM is maintaining can cover those on-the-ground situations as they arise," she said in an email. The impact on federal employees is just what Melissa Schwartz, chief operating officer at the Bromwich Group, is concerned about. "This picking and choosing shows how callous, misguided and corrupted this shutdown is," she said. "While federal employees are being used as pawns by the administration, BLM is trying to avoid shutting down things that impact stated priorities and stakeholders for whom they feel beholden." In recent days, environmental groups have expressed frustrations that the industry appears to be receiving special treatment. "BLM has locked the public out of bathrooms, visitor centers, and at least one lighthouse because of the government shutdown," Kelly Fuller of the Western Watersheds Project said in a statement. "Why isn't the oil and gas industry locked out too?" According to WWP, companies that have submitted drilling permit applications and other requests during the shutdown include ConocoPhillips Alaska, EOG Resources Inc., Novo Oil and Gas LLC, Slawson Exploration Co., and Stephens Production Co. Posing uncertainty for the energy sector is the shuttering of agencies themselves, which is stalling rulemakings internally. EPA, for example, has delayed publication of its Waters of the U.S. proposal in the Federal Register. Other pending proposals that have been delayed involve work on greenhouse gas emissions, New Source Review and reform of cost-benefit analysis. On Dec. 28, its last day of normal operations, EPA released a long-awaited plan to revoke the justification for its landmark 2012 limits on power plant emissions of mercury and other air toxics (Greenwire, Dec. 28, 2018). Almost two weeks later, however, the agency has yet to publish the draft rule in the Federal Register, a step needed to launch the public comment period. Publication may not happen as long as the partial shutdown continues, given that roughly 90 percent of EPA's some 14,000 employees are currently furloughed, according to figures in the agency's latest shutdown plan. Also likely affected is another proposed power industry rule that aims both to repeal the Obama-era Clean Power Plan's limits on carbon dioxide emissions and to revamp the New Source Review air pollution permitting program. The proposal, published in August, attracted thousands of written comments that EPA staff must read and ultimately address in the final version of the rule. The agency hopes to release that final rule in March, according to the administration's latest rulemaking agenda. The odds of hitting that target, however, dwindle every day the shutdown continues. 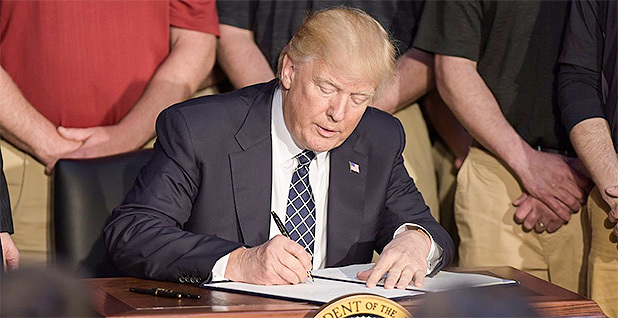 Christopher Guith, senior vice president at the U.S. Chamber of Commerce's Global Energy Institute, said companies are eager to nail down a timeline for finalizing regulations — including commenting and any litigation — by early 2020 to guard against more uncertainty that a change of administration might bring. "The business community is looking to see the regulatory progress finalized by the end of 2020 so as to minimize uncertainty for investment planning," he said. The shutdown has also affected pipeline litigation schedules and potentially stalled court-mandated environmental reviews. Following an order from U.S. District Court for the District of Montana Judge Brian Morris, the State Department issued an accelerated schedule for environmental review of the Keystone XL pipeline's alternative route through Nebraska. As promised, the agency followed through with a draft supplemental analysis of the mainline alternative route in September — and received immediate criticism from environmental groups (Greenwire, Sept. 24, 2018). But a final analysis, originally expected in December, has yet to materialize. If funding is not restored by next week, government attorneys will duck out of discussions on a motion to halt a challenge of the oil pipeline while developer TransCanada Corp. takes its concerns to a higher court. The firm is asking the 9th U.S. Circuit Court of Appeals to examine a federal injunction issued late last year against the project (Energywire, Nov. 9, 2018). Morris, who issued the injunction, has scheduled a Monday afternoon hearing on TransCanada's request. Justice Department attorneys told the court that they would not be present at the hearing if the shutdown extends into next week. TransCanada did not oppose moving forward in DOJ's absence. The State Department is working on a separate analysis of Keystone XL's cross-border permit in response to the injunction from Morris, an Obama appointee. That process began in November (Greenwire, Nov. 30, 2018). DOJ lawyers also requested that the 4th Circuit bump pending procedural deadlines in litigation over the Atlantic Coast natural gas pipeline. The court had previously set early January submission dates for documentation of the Trump administration's decision to support the project. "Absent an appropriation, Department of Justice attorneys and employees of the U.S. Department of Interior are prohibited from working, even on a voluntary basis, except in very limited circumstances," federal counsel wrote in a Dec. 31 filing. Reporters Sean Reilly and Pamela King contributed.